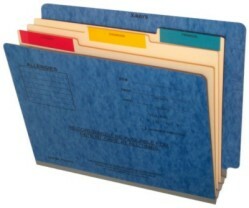 The title of "Dental Folder"
General instructions and a confidentiality notice. Side tab of back panel has custom tick marks printed for label placement. 2" Bonded fastener in positions 1 & 3 on the folder panels. Dividers have 2" bonded fasteners in position 1 & 3.